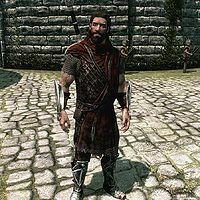 Captain Aldis is the Nord captain in the Imperial Legion and in charge of the Solitude guards. When you first arrive in Solitude he is personally overseeing the execution of Roggvir. He can normally be found pacing the courtyard of Castle Dour. If you side with the Stormcloaks, he will leave the game entirely after the Battle for Solitude. Aldis employs a rigorous schedule, supervising the training of Imperial soldiers in the Castle Dour courtyard from 8am until 8pm each day, and then returning to the castle to sleep from 8pm to 8am the next morning. He wears Solitude guard's armor, with Imperial bracers and matching boots. He carries a Solitude guard's shield, an iron greatsword, an Imperial bow, and ten steel arrows. After the execution of Roggvir, you can mention to Aldis that he was the one presiding over the execution, to which he will respond with, "Not my finest hour. Roggvir was a fine and honorable man." If you ask him how he could do such a thing, he will say, "Sometimes you just do what needs to be done. You don't have to hate a man to kill him. Though, admittedly... it helps." You can ask him if he felt that Roggvir was right in his actions, to which he will respond, "No. I think he was entirely wrong. 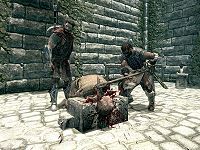 Roggvir's execution was justified and necessary. Being honorable might make you a good man, but it doesn't make you right. Be a better world if it did." While Aldis is supervising the training of Imperial soldiers, you can ask him if he is with the Legion, which he will respond to with, "That I am. Train the recruits. Turn boys into men. That sort of thing." He will then continue, saying "Thinking of asking the General for some training books. Give the soldiers something to do while they're on rest. Something besides drinking. Ever seen a book called 'The Mirror'? We used to hand it out to boys looking to learn basic shield work." If you tell him you don't have time to do that, he will say, "Be glad you're not training under me with that mouth of yours." If you find the book and return it to Aldis, he will say "Good. I'll see if I can get some copies made for the men. Here, something for your trouble. The Legion thanks you." "I think Angela needs to know." (Persuade) Passed: "I... I've been trying to find the time and place to let her know." Failed: "I'm sorry, I can't help you." "Well, I'm making it "need to know." (Intimidate) Passed: "If you want to know that bad then fine." Failed: "I'm afraid that kind of thing doesn't work on Captains in the Imperial Army." "Fine. If that's the way you want it." Failed: "That's the way it is." "Tell me about her daughter. That's an order, Captain." Passed: "Yes, Sir. Although I'm not sure you'll be happy to know." In any instance in which you pass, he will respond with "Her daughter was sent to Whiterun, the skirmishes there have been violent. The whiterun [sic] legate, he needed to know the Stormcloak positions. He sent out a party to scout the area. They happened upon a large force... I'm told none of them made it back. Private Morrard... Angela's daughter was in that scouting party. She needs to be told." During the quest For the Good of Morthal, you are tasked with delivering a letter from Gorm to Aldis. Upon approaching Aldis and telling him you have a letter for him, he will sound suspicious, asking "For me? From whom?" Upon telling him it's from Gorm, Aldis will say "Well now, that is something. Hand it over, please." He will then read the letter, and continue, saying "Oh, no. I hadn't heard from Gorm for a while, so I'd hoped he'd given up on his little scheme. The last time we'd discussed this issue was before this damnable war broke out. Things were different then. Now, what's he's asking, it's just impossible. Even if it worked, the questions and accusations it would cause..." He will then sigh, and say "Well, I'll take it under advisement. Thank you." If you approach him in Stormcloak armor, he will say, "What do you think you're doing, walking around dressed like a damn Stormcloak traitor?" Replying with an apology will resolve the situation peacefully. Replying by claiming your support for Ulfric Stormcloak will result in him saying, "Is that right? Here's how the Legion deals with rebel scum like you." A 40 gold bounty will then be added to Haafingar and Aldis and any nearby Imperial Legion soldiers will attack you. While he is training guards in the courtyard of Castle Dour, he may give some instructions to his fellow men, such as: "Concentrate. The battlefield is full of distractions. Ignore them! Focus on your targets. ", "Come on, now! I want those arrows dead center! The lives of your fellow soldiers are counting on it. ", and "Some day soon, you will all see battle. And what you do here, today, may well save your lives!" If you ask Aldis how the training is going, he will say, "Their aim could be steadier, but they're battle ready." Asking if they would be ready against a dragon, Aldis will either say, "Can any man hope to be ready for a dragon? I can but hone their skills and harden their hearts. The rest is up to the gods." or, "You're the Dragonborn aren't you? I'm sort of hoping you're going to fight the dragons for us. A normal man is no match for a dragon." After finishing speaking with him, Aldis may sometimes say "Keep my men in your prayers. They'll need them if they don't shape up. ", or "Stay strong. The Eight willing, we'll win this war." Svari: "They can't hurt uncle Roggvir. Tell them he didn't do it." Addvar: "Svari, you need to go home. Go home and stay there until your mother comes." Vivienne Onis: "You should tell her that her uncle is scum that betrayed his High King. Best she know now, Addvar." Addvar: "You're all heart, Vivienne." Captain Aldis: "Roggvir. You helped Ulfric Stormcloak escape this city after he murdered High King Torygg. By opening that gate for Ulfric you betrayed the people of Solitude." Sorex Vinius: "He doesn't deserve to speak!" Roggvir: "There was no murder! Ulfric challenged Torygg. He beat the High King in fair combat." Roggvir: "Such as our way! Such as the ancient custom of Skyrim, and all Nords!" Roggvir: "On this day... I go to Sovngarde." For the Good of Morthal: Deliver a letter to Captain Aldis in Solitude. No News is Good News: Find out about the fate of Angeline Morrard's daughter from Captain Aldis. If you finish the Stormcloaks quest Battle for Solitude, Aldis will no longer be part of the city. Consequently any quests involving him that have been started will point to a blank ground, where Aldis previously stood. There is no solution other than entering the appropriate commands on the PC to finish the quests. It is therefore recommended to finish any quests related to Aldis before starting the Battle for Solitude. This page was last modified on 18 October 2018, at 04:16.